Our speciality products are designed to help you manage areas of landscaping, including tree and shrub plantings. They help create beautiful water features and assist in the effective application of spray treatments. Turf Mark Extra is a spray pattern indicator with water conditioner and anti-drift agent. For eco-friendly algae control in slow moving or stagnant water. 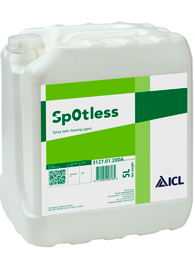 Sp0tless is a spray tank cleaning agent and general purpose cleaner.